Ferodo - I Say Ding Dong Shop - Buy Stickers, Decals & Unique Automobilia. Ferodo 'Brake Linings' Style 6 Oblong Stickers. 8.75" Pair. Ferodo 'Brake Linings' Style 7 Oblong Stickers. 9" Pair. Ferodo 'Brake Linings' Style 8 Oblong Stickers. 5.5" Pair. 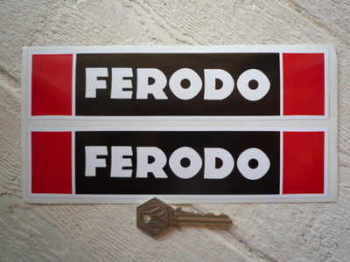 Ferodo 'Disc Brake Pads' Shaped Stickers. 4" Pair. 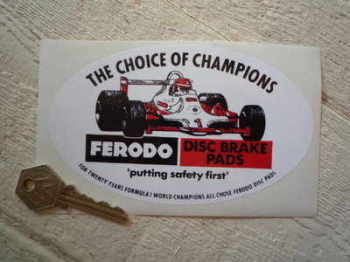 Ferodo 'The Choice of Champions' Oval Picture Sticker. 6". 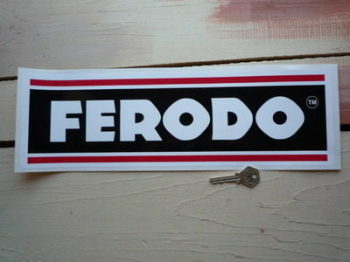 Ferodo 'The First Name In Brakes' Larger Style Oblong Stickers. 13" Pair. 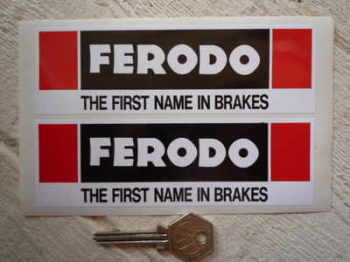 Ferodo 'The First Name In Brakes' Oblong Stickers. 6" Pair. Ferodo Black & Clear Oblong Stickers. 6" Pair. 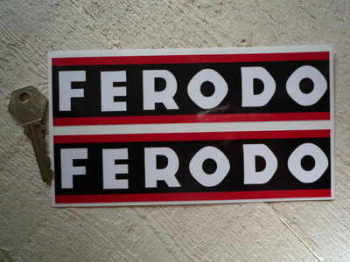 Ferodo Black & Red Line Oblong Sticker. 15.5". 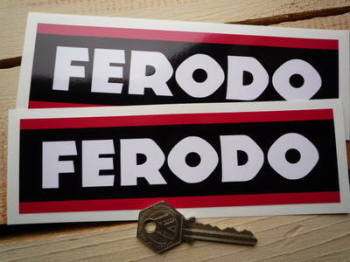 Ferodo Black & Red Line Oblong Stickers. 4", 6" or 8" Pair. 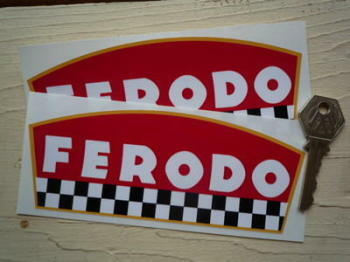 Ferodo Chequered Flag Stickers. 5" Pair. Ferodo Cut Vinyl Stickers. 4" Pair. Ferodo Disc Pad Shaped Chequered Stickers. 6" Pair. Ferodo Later Style. Black & Red Oblong Stickers. 8" Pair. 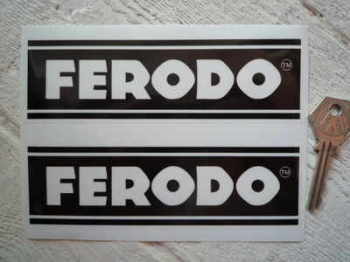 Ferodo Narrow Style Oblong Stickers. 7" Pair. 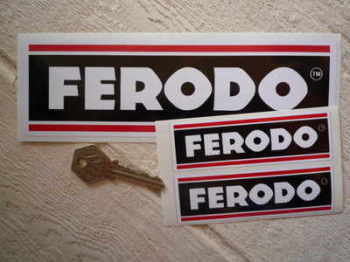 Ferodo Narrow Style, Red, Black, & Off White, Oblong Stickers. 7" Pair. Ferodo Old Stag Oblong Stickers. 11" Pair. 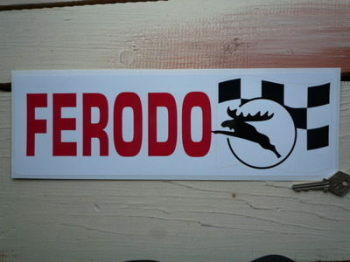 Ferodo Stag & Chequered Flag Sticker. 13.5". Ferodo Stag Style Oblong Stickers. 12" Pair. Ferodo Stag Style Oblong Stickers. 14" Pair. 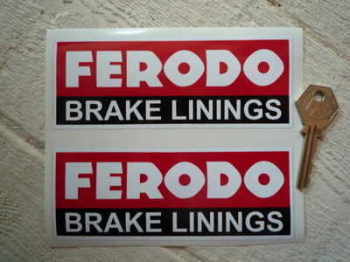 Ferodo Stock & Recommended Brake Linings Sticker. 20.5". Ferodo Style 3 Beige Oblong Stickers. 6.75" Pair. Ferodo Style 3 Oblong Stickers. 6.5" or 8" Pair. Ferodo Style 4 Oblong Stickers. 8.25" Pair.